Music for Moppets is a music readiness program designed for 4 and 5 year olds. This class of 4 to 6 students involves learning music concepts, learning steady beat and rhythm patterns, finger coordination, piano orientation, ear training, improvising and composing simple melodies. Ursula makes music fun for little children. Students play games and do activities that is age appropriate to reinforce important musical concepts such as high and low, fast and slow, long and short, loud and soft. Students are able to play short melodies, improvise and recognize musical symbols from the beginning. 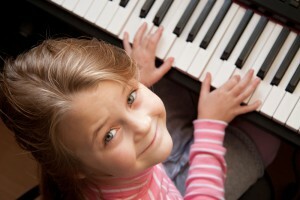 Most children are able to read and play music in a short period of time.